Sign up and receive Property Email Alerts of Freestandings for sale in Cedar Lakes, Randburg. Perfectly positioned within the estate, this alluring residence has been meticulously maintained and a home which has given the family endless pleasure, where glorious memories have been forged. The attractive drive way and inspiring front entrance creates an awe inspired wow factor. Here we are greeted by warm exposed brick and accompanied by high volume ceilings. The family room leads onto the covered patio with wood burning fire place is a true surprise factor of the ground floor living space. The well positioned eat-in kitchen enjoys a six plate standalone gas stove, Caesar tops and large scullery with a back entrance to a courtyard. This flows onto an additional living area that one can enjoy the comfort of being outside. A guest cloak room and three bedrooms (2 en-suite) complete this modern family home. A truly romantic master suite with summer lounge, walk-through dressing area and tastefully appointed en-suite bathroom, with a private outdoor shower. All rooms have double doors allowing for tranquil views of the surrounds. The landscaped gardens overlooks the solar heated swimming pool, perfect for glorious summer entertaining. Additional features of this property include a 2000ltr storage tanks for irrigation. A double auto mated garage with a domestic room. The estate has an awesome clubhouse with restaurant and coffee bar overlooking the lake. Plus, a swimming pool, astro-turf soccer arena, tennis courts, catch and release fishing in the dams and plenty of walking trails. 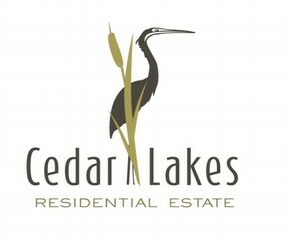 Cedar Lakes Lifestyle Estate adjacent to Broadacres Shopping Centre, and close to Fourways Mall, Montecasino, schools, Life hospital and Lanseria Airport, is a unique Residential Estate. Sign-up and receive Property Email Alerts of Freestandings for sale in Cedar Lakes, Randburg.